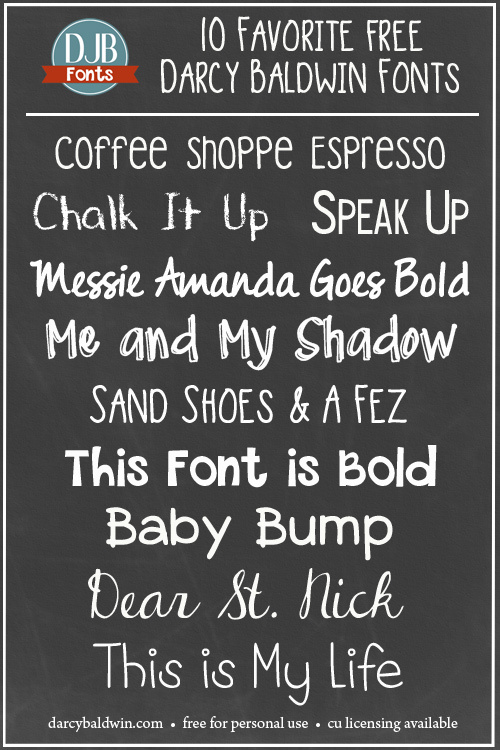 I’m often asked about the most popular or the most downloaded or my favorite fonts, so I’m putting together a series of the most favoritest fonts at DJB Fonts (I just made a new word up there, ya know 😀 ) So here are my..
All of these fonts are free for personal use (not-for-profit). If you have a question about what constitutes personal use, check out this info or contact me with questions. If you would like to use any one of these fonts for your commercial/professional ventures, please purchase a commercial use license here. For your records, be sure to include the name of the font you are purchasing the license for. Click on any name below to be taken to a download. Thanks for the great fonts! You are simply awesome, Darcy. Love your work!!! Thank you for sharing your talent. You have some wonderful fonts!